Numbers matter. Why? Because God wants His house full. Look what it says in Luke 14. It is interesting who Jesus tells the disciples to go and compel to come. It was the poor, the crippled, the blind, and the lame. Jesus knew that the best time to reach someone is when they are down. In the parable Jesus used to illustrate this, He had first invited people who were doing well in life. One had just bought some land (had money). One had bought 5 yoke of oxen (like buying 5 cars today). And one was getting married (happy time in life). And all three turned the invite down. Why do you need Jesus when things are going so well for you? It's not impossible for people to come to Jesus when they are in an upswing in life, but it is more difficult. Jesus reminds us about this when he talked about it with the rich young ruler, who choose a good, comfortable life over an adventurous, uncertain life of traveling with Jesus. Let's fast forward today. Who should we compel to come to church? Those who are hurting in some way. There are wealthy people who are hurting in their relationships. There are successful people who are having trouble with their children. There are happy people who appear to have it all together on the outside, but inside they are hurting. So, how can you invite people to come to your church with the intention of seeing them come to Jesus? Let's look at 10 ways you can compel people to come to Jesus. Compel them by teaching your members the importance of sharing their faith. You get what you emphasize. Help every child and parent see that they are called by God to share their faith and compel people to come to God's house. Compel them to come by using invite cards. A practical tool you can give your kids and parents is invite cards. They can use these invite people to come. Compel them by having soft touch events. Fall Festival is an example. An Easter egg hunt is an example. Family events are an example. This gives your members an easy way to invite those they are trying to compel to come. Compel them by equipping people to share their faith. A big reason why more believers don't compel people to come is because they are not confident to share their faith and invite people to come. In that case, the shortfall is our responsibility as church leaders. We are told to "equip" people for the work of the ministry. I created a 4 week teaching series called "The Blab Lab." Each week, you give the kids a tool they can use to "blab" about their faith (share their faith). When we did this, we had one girl who used the tool to share her faith with her entire public school classroom. Here's a video sample from the curriculum. Churches across the country have used this series with great results. It is available for you at this link. Compel them to come by hosting special days at church. Teacher day. Fireman day. Veterans day. Police officer day. Veterans day. Coach's day. Compel them by meeting their needs. When people are hurting, it's a key time that you can reach out and compel them to come in so they can find what is needed. A great example of this is a family who has a child with special needs. They are looking for safe places where their child can be treated with gentleness, love and respect. You can compel people to come by being that place. 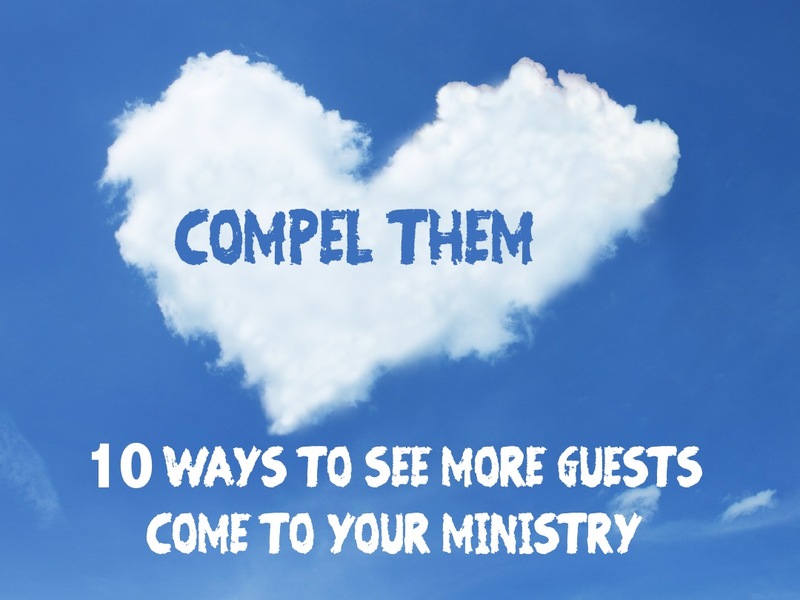 Compel them by having a special guests. As your budget allows, see about bringing in some special guests. People will come to meet people they look up to. It might be a football or other sports player. It might be a kid celebrity who is a follower of Jesus. It might be a popular singing group. You might be thinking, they would never come to my church. Don't fall into that line of thinking. You will be surprised when a special guest says "yes"" when invited. Several years ago, I invited a special guest to come in. At the time, we had about 600 kids coming each weekend. I challenged the kids to bring their friends and we made a goal of having 1,000 kids present on that Sunday morning. The day came and we had over 1900 kids show up. It worked big-time! Compel them by having a guest contest. Get kids excited about bringing guests. It could be a contest between the boys and gifts for who brought the most guests. It might be the person who brings the most guests by himself or herself. I remember several years ago, I had a big day where we emphasized kids to bring guests. One young man brought his entire football team. Yep...26 guests by one child. Compel them by using social media. Get the families in your church to start using their social media connections to spread the word about your church. Compel them by mail outs. This old school method of inviting people to come still works. We get so much email today that a postcard or hand written invite, is a big, big deal. Make sure the invite is done professionally and pops. I have used many of these strategies to see hundreds of guests compelled to come to church. And when they get to church they are met with the power and love of God. A love that can transform their life. Your turn. What are some other ways you have used to compel people to come to church? What are ideas you've been thinking about in regards to compelling people to come? Share your thoughts and insights in the comment section below.